A jigsaw, also called an orbital saw, is great for woodworking projects of all types. The best jigsaw will include features that make it easier for you to get more done. A jigsaw is not limited to wood, however, so pick up a saw that has variable speed settings to assist you with different types of cuts and materials. Whether you are making lawn decorations or building a custom cabinet, having the right jigsaw for the job will save you time and make the work go faster. Below are three of the top ranked orbital jigsaws on the market, including a cordless model that brings total portability. Blades are available for different grades of wood, plastic and PVC, metal, and masonry, among others, and that means you can use one saw to accomplish tasks in the garage or around the house that often require different types of saws. 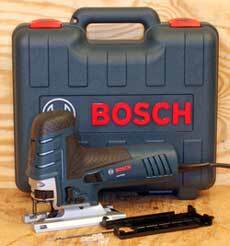 The only non-American made jigsaw in this group (and our top pick) is the German-designed, Swiss built Bosch JS470E. It features a tool-less blade change and ejection system that eliminates the need to ever touch a hot blade, and a 4-position orbital setting so you can get different strokes. The die cast foot provides increased stability for cutting curves or other patterns, and variable speed motor will let you tone things down for intricate work on delicate materials. 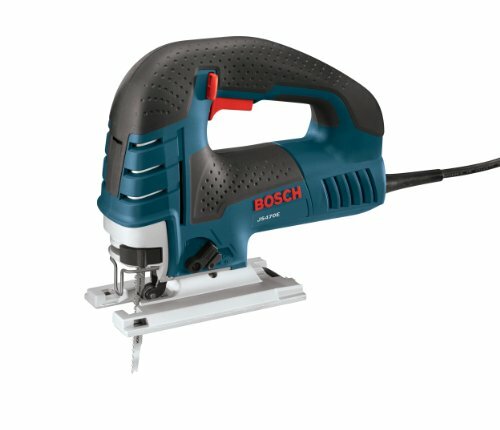 To make it easier to use for long periods, the Bosch JS470E includes a vibration dampening system that provides a smoother, more reliable cut. The 7 amp motor has enough power to cut through almost anything, and an adjustable blade speed of 500 to 3100 SPM (strokes per minute). Cut wood up to 5-7/8 inches thick, or metals in thicknesses of 3/8″ for heavy metals to 7/8″ for aluminum. To reduce muscle fatigue there is a lock on switch, and the saw comes with Bosch’s patented anti-splinter insert to give you sharper, straighter cuts. There’s not much to complain about with this model, including the easy adjustment foot that allows you to create more complex cuts with up to 45 degrees of blade tilt. For avid woodworkers, you do need to keep in mind that the blade does slightly overcut (the bottom of the blade is further away than the top). Built with an innovative Keyless Blade Change, DeWalt has a firm entry in being one of the top jigsaws for every job with its DC330B. It’s built using DeWalt’s patented 18v Li-Ion battery design, so you can use the batteries you already own for your other DeWalt tools. A comparable 20v Max version is also available. The foot has 4 bevel indents at 0, 15, 30 and 45 degrees, and the solid metal shoe design will stand up to jobsite use without warping or bending. The SPM can be adjusted from 0 to 2000 SPM, suitable for all but the most demanding of jobs, and there’s a full 1 inch of blade stroke for faster cutting through thicker materials. If you were not already a fan of DeWalt products, the ergonomic feel and professional features of the DC330B would be enough to convert you. 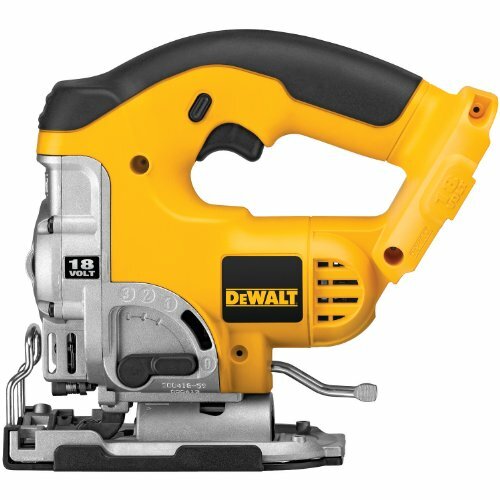 The only drawback with this offering is that it comes without a battery, so unless you already own other DeWalt 18V tools you will need to buy one in addition to the jigsaw. The good news is that’s it’s actually cheaper in many cases to buy this tool and battery separate. Also, those with several tools from the company save money and space by not purchasing yet another battery. The PCE345 comes with a 6 amp motor and blade SPM ranging from 0 to 3200, so you have the speed and precision available for every cut you have to make. The 4 position lever means you can quickly adjust the orbital position for different applications and materials. There’s even a keyless blade change feature so you can get back to work faster than ever. The foot easily adjusts to any of 4 bevel angles for precise cutting, and the LED light provides a clear view of the area you are cutting. A 7-position speed dial is integrated directly into the trigger for instantaneous changes. There have been some complaints from people who say the quick change mechanism is not sturdy enough, but the only overall concern for most people will be that the chassis design does not provide ergonomic support, so extended use is likely to cause a degree of muscle fatigue. 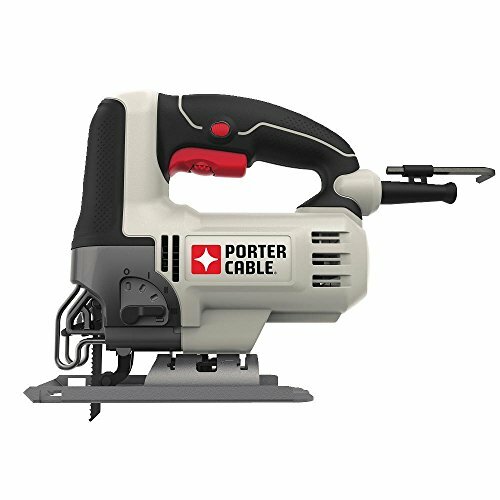 In most respects, this is the best value as far as jigsaws go, but if you don’t mind stretching your budget a bit, the Bosch or DeWalt are a step above the Porter-Cable. If a courser cut at a faster speed is what you need, you may instead want to look at a reciprocating saw.